This is a big film week in Waterloo Region. It’s the 10th anniversary of the Grand River Film Festival (GRFF), which runs October 24-29. Cambridge arts and culture champion Tamara Louks is at the helm, looking to bring bold, reflective and inspiring films to Waterloo Region. Tamara is the executive director of GRFF, and is up to her eyeballs in all things festival this week. Her and the 80+ volunteers, who provide more than 1,000 hours to help plan, market and execute the festival’s programs. This once small and now impressive, region-wide film festival includes a short film competition, educational outreach program, and industry-day panels in addition to local, Canadian and international film screenings. But the work pays off when they can deliver an amazing festival lineup. And key to the festival is the inclusion of Canadian films. “Canadian films reflect our culture, our places and our people,” says Tamara. “And equally important, it’s our industry. We talk about eating and shopping local, and film is no different.” The film industry is tough and it can take years to make a film and get it in front of an audience. Tamara loves that GRFF gets to help connect people to the power of film, highlighting the incredible filmmaking talent in Canada. As a life-long film fan, Tamara says Disney films were her favourite as a kid, and she moved on to pop-culture classics such Star Wars, Grease and Breakfast Club. At university, her interests turned to Canadian and international films and documentaries. So spending nine years involved with GRFF makes sense. “Film has the ability to immerse you in the story and feel something: to echo someone’s happiness, to cry with someone’s pain or be saddened by hatred,” she says. Watching a film in a theatre with others creates a shared experience that can’t be replicated in your living room. For Tamara, art, film, music, theatre, books, architecture and design is what gets her out of bed every morning. “We all need the basics to live: housing, employment, clean water, safe streets, but the inclusion of arts is what makes a community special; it’s where you want to stay,” she says. P.S. Tamara’s favourite topic of conversation: asking What’s new? What’s happening? P.P.S. You can find me at GRFF’s showing of Bruce McDonald’s Weirdos this Saturday. While green beer and epic street parties can signify St. Patrick’s Day in Waterloo Region, this year Sue Nally is planning something different. She is hosting the Irish Real Life Festival (IRL) from March 12-19. An intrepid team of volunteers – Margaret Nally, Ruth Shushan, Kate Swift, Jamie Cooper, Deirdre Nally, and Margaret O’Shea-Bonner – have pulled this event together quickly and are planning a range of activities for the whiskey-lovin’ citizen to the literature-lovin’ citizen, and lots in between. While hard pressed to pick a most-anticipated event, Sue is excited about the unique events planned. At Over the Rainbow, Bataireacht or Irish stick fighting, will be showcased, something that has never been performed in the region and the beer event, What Ales Ya, will have rare beers to sample. The Irish literary salon, Beyond Brooklyn, will focus on contemporary Irish literature, something many people may not know about, and Whiskey and Whimsy blends storytelling with – yup – whiskey tasting. You can plan your IRL Festival activities online, and keep up-to-date on Facebook, Twitter and Instagram. Be sure to say hi to Sue as you #Paintthetowngreen. P.S. Sue’s favourite topic of conversation: new and exciting ideas about anything and everything. It had been a while since I saw a movie at the Princess Cinema Original and I had forgotten its charms. The old-time, wooden ticket booth, the real butter for your popcorn, the hit-and-miss comfort levels of the seats, and the amazing range of engaging and thought-provoking movies. 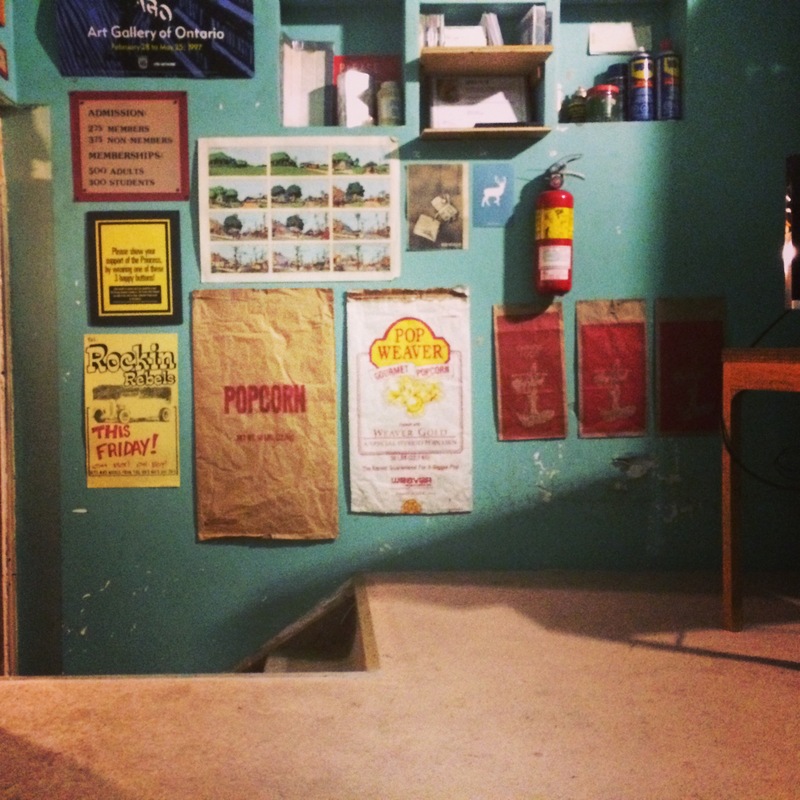 On my way out, I sneaked a peak into the quirky projection booth. It’s just as you’d hope to it: old popcorn bags for art, bottles of WD-40, peeling, sea foam green paint, all with a little sheen of grit. And since I know you were curious, I saw Jim Jarmusch’s Only Lovers Left Alive with the stunning Tilda Swinton. #vampires #TildaSwintonisamazing. What have you seen lately? Get this good stuff delivered to your inbox. Want Waterloo Region arts and culture profiles delivered fresh to your inbox? Enter your email address and we can make this happen. Thank you!